Dogs and cats are prone to developing many of the same ailments that people have to deal with, such as cancer, diabetes, cardiac disease, and liver or kidney failure. Making an diagnosis involves a combination of skills, knowledge, and creativity as well as utilizing appropriate tests. Our in-house laboratory allows us to run many diagnostic tests, including complete blood work, urinalysis, and other specialty testing, quickly and accurately. When blood tests are not indicated or inconclusive, we are capable of obtaining high quality diagnostic x-rays and ultrasound images of your pet on site and immediately. 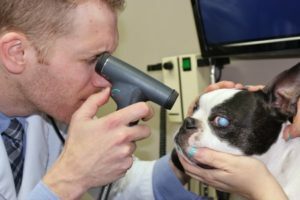 Dr. Todd will review your pet’s medical history and current condition, and then review his recommended diagnostic tests. Our goal is always to restore and maintain your pet’s quality of life, and our recommendations reflect that. Whether your pet can be managed as an outpatient, or requires more intensive hospitalization and treatment, you can feel secure that their well being is our only goal. Owners of hospitalized patients will be kept up to date with any progression to their pet’s status. Owners are also encouraged to visit their pets when hospitalized.